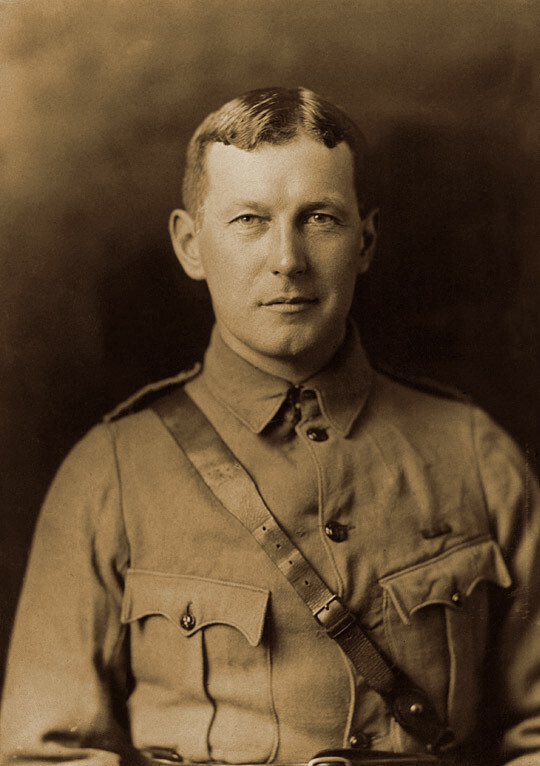 Canadian doctor John McCrae wrote this poem on a May morning in 1915 in Ypres, what had been a stunning Belgian medieval city then horribly bombarded in the ghastly slaughter of the First World War. The evening before McCrae wrote In Flanders Fields, he presided over the burial of his friend Lt. Alexis Helmer, who died by German shellfire on May 2. McCrae was one of many soldiers serving in WWI who found writing poetry an outlet for the horrors and grief, hope and homesickness of the conflict; others include Wilfred Owen, Siegfried Sassoon, Rudolf Binding, and Laurence Binyon. In Flanders Fields may be among the best known poems from the era today, in part due to the power and symbolism of the poppy flowers he evoked. 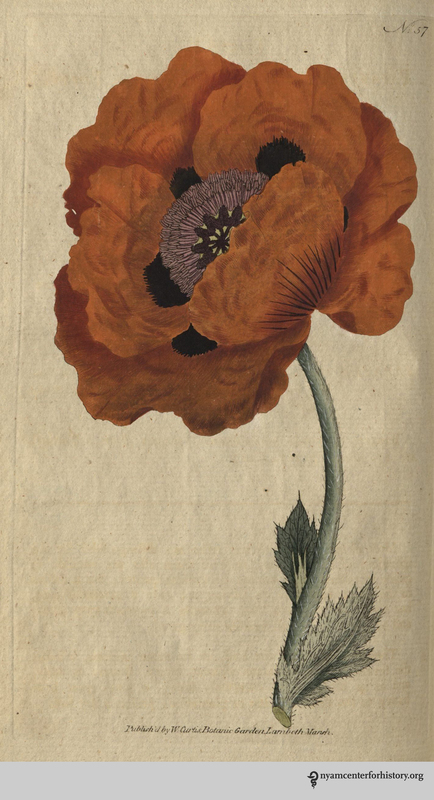 The flowers McCrae was looking at that May were Papaver rhoeas, the corn poppy beautifully shown in The British Flora Medica by Benjamin Barton. The sensation caused by the publication of McCrae’s poem got the flower rechristened the Flanders poppy. Red or corn poppy. Source: The British flora medica: a history of the medicinal plants of Great Britain by Benjamin H. Barton and Thomas Castle (1877). 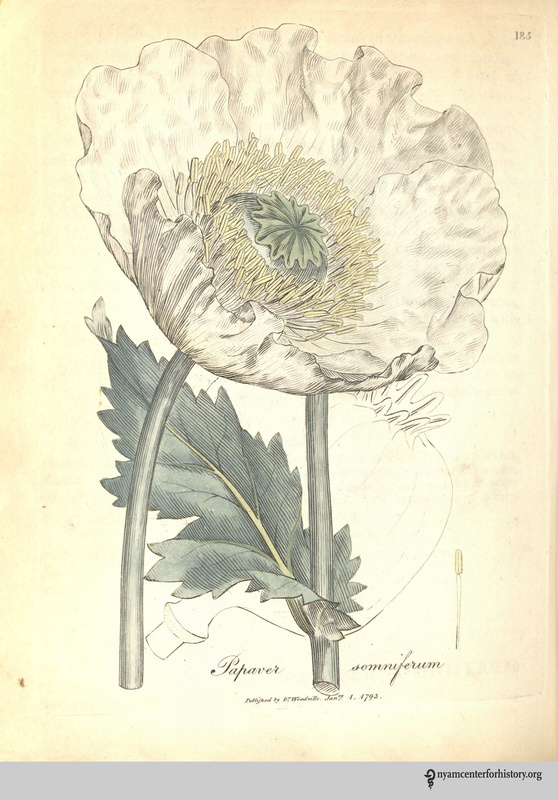 In the popular mind, the corn (or Flanders) poppy is often confused or conflated with its cousin, Papaver somniferum –bringer of sleep- the opium poppy. Papaver somniferum pods contains a resin that has morphine and codeine (the only flowering plant known to contain morphine). Both species spread to Europe and across Asia from the Middle East, helped along by trade routes as well as the Crusades. Since ancient times the opium poppy was used as a pain killer, making it a constant companion throughout history to the battlefield wounded, to veterans, and to civilian populations. In high enough doses, it can cause death. 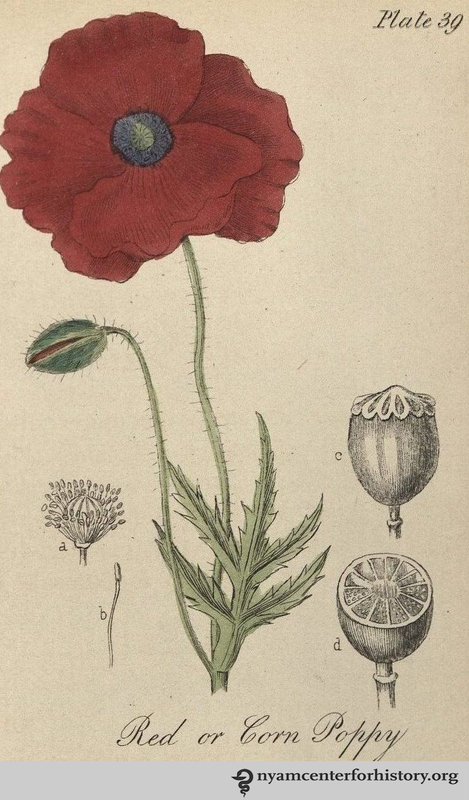 By contrast, the corn poppy’s milky sap contains alkaloid rhoeadine, a sedative. From ancient times to the present, the corn poppy has been used to make soporific tea, a milder respite than that offered by its cousin. Opium poppy. Source: Medical Botany by William Woodville (1793). The corn and opium poppies have had a long relationship with people and war. Indeed, the opium poppy gave its name to conflicts over British trade rights and Chinese sovereignty in the min-19th century, called The Opium Wars. Poppies have been on many battlefields as relief from pain, a resource to fight over, and as a vivid, little sign of hope or remembrance. The flower as an official symbol for remembrance has roots in New York City. University of Columbia professor and humanitarian Moina Belle Michael wrote a response to McCrae’s poem, We Shall Keep the Faith, in 1918. Inspired by McCrae’s imagery, she wore a silk version in remembrance of the war’s dead, and spearheaded the American movement to have the flower officially recognized as a memorial symbol, and for money from its sale to help veterans. Across the Atlantic, another Poppy Lady, Anna Géurin, campaigned for selling flowers particularly to aid the women and orphans of France. Eastern poppy. Source: The Botanical Magazine, v2, plate 57 (1788). A grisly fact underlay the profusion of poppies on the Western Front. The soil of Flanders had not been rich enough in lime to sustain massive numbers of poppies. The infusion the earth received from the rubble of towns and the calcium from human bones allowed the poppies to flourish in greater numbers than ever before; a fitting beacon of regeneration as well as an ever present sign of the dead and destruction. David Lloyd. Battlefield Tourism: Pilgrimage and the Commemoration of the Great in Britain, Australia and Canada. Oxford: Berg; 1998. Nicholas J. Saunders. The Poppy: A History of Conflict, Loss, Remembrance & Redemption. London: One World; 2013. The Story Behind the Remembrance Poppy. The Great War 1914 – 1918. Accessed April 13, 2017. William Stidger. Soldiers Silhouettes on our Front. New York, Scribner’s Sons; 1918. 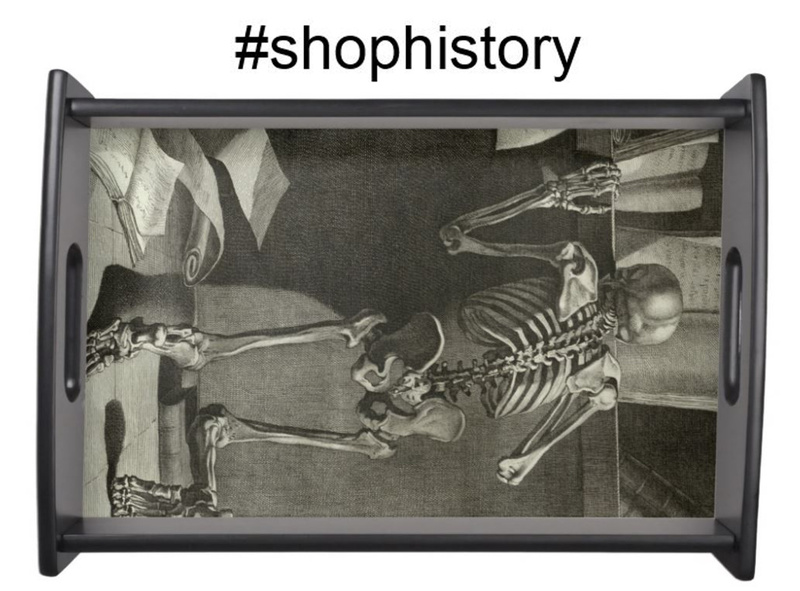 Click here to search our collections.